Police are appealing for information after an incident in Aylesbury during the morning rush hour when a man repeatedly made inappropriate comments towards a teenage girl. Police have released the e-fit above following an incident at around 8am on Tuesday October 2. A 14-year-old girl was walking from Tesco on Tring Road, along Victoria Road and then waited to cross at the traffic lights on Tring Road when she became aware of a man ahead of her. As she crossed the road and walked past the man on to Walton Road, the man made an inappropriate comment. As the girl continued to walk along Walton Road, the man walked at the same pace on the other side of the road making further inappropriate comments. The girl then began walking quicker and the man walked off down Queen’s Park. The offender is described as a white man in his mid-fifties, around 5ft 9ins tall and of a slim build. 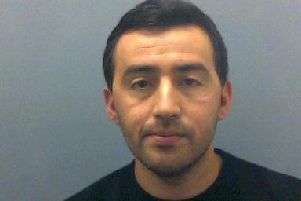 He is bald and has sunken eyes and was wearing a dark hooded top, suit style trousers and trainers. Officers believe that this incident is linked to a sexual assault on Friday September 7 in which a teenage girl was inappropriately touched by a man on Walton Road. Investigating officer PC Graham Gray said: “I am keen to hear from anyone who may have CCTV or dash cam footage from this area on Tuesday morning. "Equally, if you recognise the description of this man please get in touch. “We take incidents such as these very seriously and are following a number of investigative leads. "The neighbourhood team will be patrolling the area during school drop off times so please approach them with any questions or concerns that you have. “If you have any information that you think could help this investigation, you can let us know using our online contact form, quoting reference 43180303082, or by calling 101.